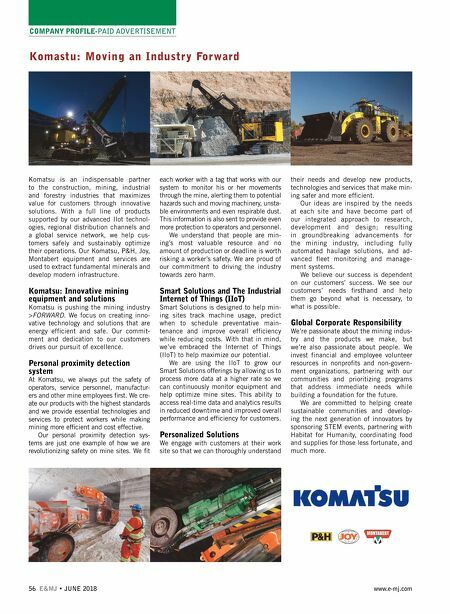 56 E&MJ • JUNE 2018 www.e-mj.com COMPANY PROFILE-PAID ADVERTISEMENT Komastu: Moving an Industry Forward Komatsu is an indispensable partner to the construction, mining, industrial and forestry industries that maximizes value for customers through innovative solutions. With a full line of products supported by our advanced IIot technol- ogies, regional distribution channels and a global service network, we help cus- tomers safely and sustainably optimize their operations. Our Komatsu, P&H, Joy, Montabert equipment and services are used to extract fundamental minerals and develop modern infrastructure. Komatsu: Innovative mining equipment and solutions Komatsu is pushing the mining industry >FORWARD. We focus on creating inno- vative technology and solutions that are energy efficient and safe. Our commit- ment and dedication to our customers drives our pursuit of excellence. Personal proximity detection system At Komatsu, we always put the safety of operators, service personnel, manufactur- ers and other mine employees first. We cre- ate our products with the highest standards and we provide essential technologies and services to protect workers while making mining more ef fi cient and cost effective. Our personal proximity detection sys- tems are just one example of how we are revolutionizing safety on mine sites. We fit each worker with a tag that works with our system to monitor his or her movements through the mine, alerting them to potential hazards such and moving machinery, unsta- ble environments and even respirable dust. This information is also sent to provide even more protection to operators and personnel. We understand that people are min- ing's most valuable resource and no amount of production or deadline is worth risking a worker's safety. We are proud of our commitment to driving the industry towards zero harm. Smart Solutions and The Industrial Internet of Things (IIoT) Smart Solutions is designed to help min- ing sites track machine usage, predict when to schedule preventative main- tenance and improve overall efficiency while reducing costs. With that in mind, we've embraced the Internet of Things (IIoT) to help maximize our potential. We are using the IIoT to grow our Smart Solutions offerings by allowing us to process more data at a higher rate so we can continuously monitor equipment and help optimize mine sites. This ability to access real-time data and analytics results in reduced downtime and improved overall performance and efficiency for customers. Personalized Solutions We engage with customers at their work site so that we can thoroughly understand their needs and develop new products, technologies and services that make min- ing safer and more ef fi cient. 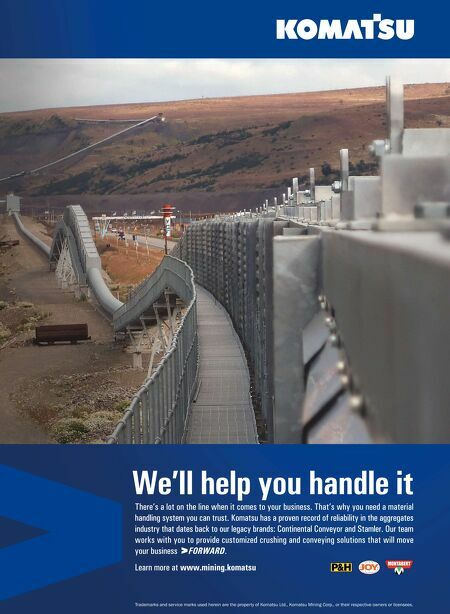 Our ideas are inspired by the needs at each site and have become part of our integrated approach to research, development and design; resulting in groundbreaking advancements for the mining industry, including fully automated haulage solutions, and ad- vanced fl eet monitoring and manage- ment systems. We believe our success is dependent on our customers' success. We see our customers' needs fi rsthand and help them go beyond what is necessary, to what is possible. Global Corporate Responsibility We're passionate about the mining indus- try and the products we make, but we're also passionate about people. We invest financial and employee volunteer resources in nonprofits and non-govern- ment organizations, partnering with our communities and prioritizing programs that address immediate needs while building a foundation for the future. We are committed to helping create sustainable communities and develop- ing the next generation of innovators by sponsoring STEM events, partnering with Habitat for Humanity, coordinating food and supplies for those less fortunate, and much more.